Another month, so another travel escapade became necessary to relieve the stresses already built up these past few weeks. Where did I head to this time? 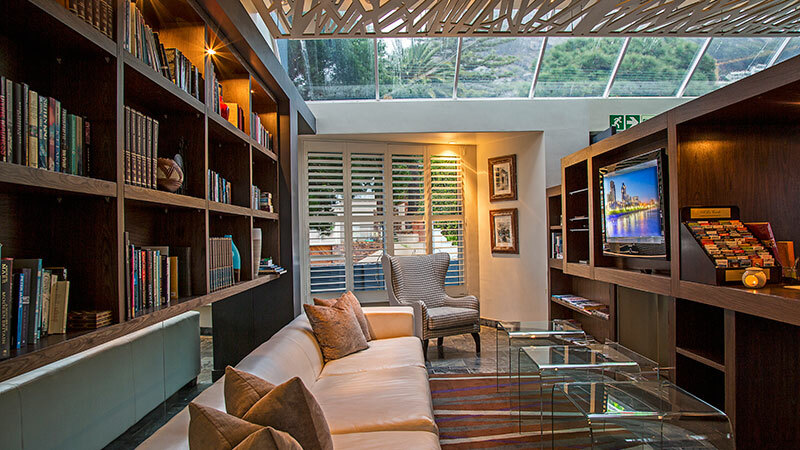 There is a dark architectural fusion wonder of urban chic and classic design, nestled in the deep recess of the Cape Town city, overlooking the Atlantic Seaboard. Welcome to O on Kloof Boutique Hotel & Spa. Enter a neighborhood bereft of the usual hustle and bustle of inner city life, to a traditional townhouse, housing unassuming hospitality. I used my MyCITI bus card to take the scenic route to the hotel, which drives through some really lovely suburban communities, photo-perfect panoramic views, and even past decadent fun-sized vacation homes. One enters the chill hotel, to a glass of bubbly, and a check-in process that doesn’t leave you dreading basic human interaction you were probably trying to escape from, within your normal life. The hotel lobby is decorated and structured, like what one might imagine stepping foot into the anachronistic ‘The Joneses‘ suburban home is like: tasteful decor and layout, but still a livable home. It is intimate with its library/study-style, but spacious – making use of a combination of dark textured material, pops of rich colors, and warm lighting, to make the space seem larger than average, but not austere. Walking to my suite took 3 seconds…and then the fun really began. I had the pleasure of staying in one of the luxury suites available. The perks of staying in one of these suites, are abundant. Guests have access to: a king size bed with fine linen, a lounge area with a double couch, a bath and shower in one luxurious en-suite bathroom – not to mention a private jacuzzi spa bath. In between syncing my rem cycle, raiding the bar fridge and enjoying the sunsets, I snuck off to the O on Kloof Spa. These knots wont massage themselves away. The Spa is motivated to provide each of their guests with a treatment that is focused on results, and customized to your body’s needs and wants. Honestly, you could get massaged elsewhere! But the masseur team at this spa, will teach you as much as they’ll pamper and relax your mind and body. Ventilation may be a bit of an issue for some, considering the small space they operate in, but the products used, and the hands of the saints that deign to massage you, will leave you loose-limbed and sleepy content. I recommend the O Spa’s signature African Shea Aroma-therapeutic massage. The Spa folk managed to ease the pain I had from a shower-falling incident (don’t ask). The building blends in with the city skyline, while elevating guests just enough to immerse themselves in the captivating panoramic sunset view. One does not feel claustrophobic within the building, nor while exploring the hotel space – despite closely packed suites and rooms on the property. Unlike other boutique hotels who mostly theme each suite, O on Kloof tries its level best to balance being interesting, with classic sophistication; eventually finding its decor and ambiance footing, somewhere between “nice” and “dependable”. Sometimes, in order to be consistent, hotels need to forget the gimmicks of pop art deco design, and stick to a working minimalist design motif. This is why I think O on Kloof will keep its doors open for atleast a while yet. Besides, they have an ace-in-the-whole: Priceless sunset views. There is a secure spa, jacuzzi(for the suite’d), gym and pool for the folks in need. The spa area overlooks the magnificent indoor pool, which is heated for the winter season. There is a kitchen open for guests to get breakfast and light lunches, whipped up for their dining pleasure. One can socialise over bubbly, or the hotels selection of celebrated local wines. Alternatively, guests may indulge in a quiet drink, in the lounge, or cozily around the intimate fireplace. There are a few set of steps to contend with, and no elevator to be found. While maneuvering within the establishment is spacious enough to be comfortable, I wouldn’t wholly recommend it as safe for those needing special arrangements due to a disability. Please inquire from the hotel though, in case they can accommodate your specific requirement. There are a few sharp corners, but mostly everything can be worked around for small humans. Family’s would be well-accommodated in these rooms. While my reviews of the White House Beach Villa have taken me on a roadtrip to the coast, and Majeka House took me to the winelands, O on Kloof Boutique Hotel gives you a boutique hospitality experience, from the convenience of the city. You’re in the hub of all the goings on, but far enough from the actual noise. It’s not beyond the realm of reason, and my suite in particular is ideal for those craving a luxurious experience for a bargain. *NOTE: Please change Youtube Quality View setting to 480p to see video in best visuals.